I went to get a manicure the other day, and as I'm getting a lil tired of the animal print nails, I remembered my mum telling me about the 'louboutin' manicure, so thought i'd ask the manicurist to give it a go... 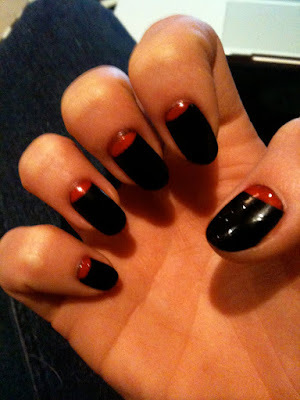 It involves a simple black nail with a small red half moon. Result? I actually quite like it... it's different and I love black nails, so was nice to add a little twist to it. There is another type of 'Louboutin' manicure where you have the top of your nail painted black, and the underneeth of your nail painted red, but can be tricky for people who don't wear acrylics like me cos you need the length ! What do you think? Lemme know ! Love them! Although your nails look real! They are real lol i dont get acrylics ! I had that manicure but i'm awful with manicures and ruined it as soon as i got home! So cute and very appropriately named! Christmas Haul... What me gots !